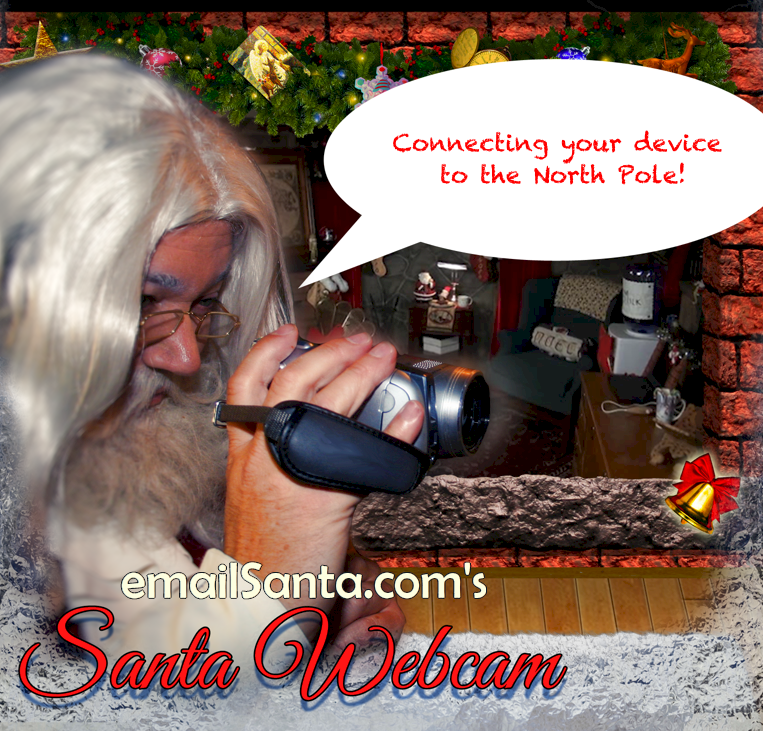 Santa webcam live video stream from the North Pole! Watch Santa! on his North Pole web cam! How can you see Santa live at the North Pole? The Santa Tracker tracks Santa every day of the year! Santa's Webcam (this page!) shows Santa Claus live at the North Pole! Snoop on Santa getting ready for the big night on the Christmas Eve Santa Snooper! Click the green button to see Santa live on the Santa webcam! There's a lot of magic in Santa's Web cam, so make sure to use WiFi or something other than Data to connect. I think it's the bomb. So why little sugarplums did I do it? up at the North Pole. Why it's as crazy as a fruitcake in July! They're as big as a horse! A Christmas party that is! And they don't tell anyone about how many cookies I sneak! Now where is that button that turns off the sound? That way I won't get into any more trouble! The Santa Webcam is available in the App Store! Just touch the App Store Graphic above or here to get it! Check out more fun things to do at emailSanta.com, like seeing what everyone at the North Pole is tweeting & texting to each other! SPECIAL! Snoop on Santa Christmas Eve at emailSanta.com! (The elves call it the Santa Snooper !) Click here to see Santa's Christmas Eve Santa Tracker right now! You can be a Santa tracker every day of the year right here! You can also get a reminder to come back to emailSanta.com closer to Christmas. Come back Christmas Eve Day &EVERY day to watch Santa & his reindeer LIVE on the Santa Webcam! You can also help "Elf Control" track & talk to Santa Claus on his famous flight & send him emails! Where is Santa Claus right now in the world? Oh sure, make a grumpy elf look for you. You didn't see where Santa was BOO! right above me? Yes, that one -- right there! Boo2222 that right now Santa Claus is GrumpyMsg0. I'll bet if you come back to this page in a few minutes he'll be somewhere else, just to make me look silly! See, now you made a grumpy elf even grumpier! Where is Santa Claus on a map now? Do you mean like Finding Nemo? I'd tell you Santa is GrumpyMsg0, but now I'm wondering if Bruce the Shark has ever been to GrumpyMsg! What is the address for Santa Claus right now? Well, let's see. Right now, he's GrumpyMsg0. Mind you, he does move around a lot. But, yes, I think his address is always The North Pole ! I want to find Santa Claus. Why did you lose him!?! Flying fruitcakes! For a grumpy old elf I sleigh me! Oh, I did it again! I'd tell you Santa is GrumpyMsg0, but now I'm laughing too hard! Ooh! Ooh! Is this like one of those Where's Waldo or Where's Wally games? I might be a grumpy elf but I still like to play games! Where is Father Christmas right now? Well right now Father Christmas is next to a... no, he moved. Wait, now he's beside a... moved again! And then he... Ahh! I can't tell you where Father Christmas is right now if he won't stop moving! What about the NORAD Santa Tracker? Why doesn't NORAD ever want to track me? Sure there's a real NORAD Santa Tracker for kids, but is there a NORAD Santa Tracker for elves!? Is it because I'm so grumpy!? I'm just glad they don't track Santa EVERY minute of every day of the year! Now THAT could be embarassing! I don't know what Santa is doing right now, but it sure would be weird if he was tracking himself on the Santa Tracker! What about track Santa NASA? No, No, No! It's Santa CLAUS! Not Santa NASA! Now you've made me so grumpy I think I'm just going to leave and visit with Santa where he is now, GrumpyMsg17.